My husband and I love pasta with peas. Anytime I make pasta I almost always throw in a cup or two of frozen green peas. Three things I always have on hand in my kitchen; garlic, olive oil, and frozen green peas. True statement. Some people hate peas. I love them, and boy am I glad I married someone who loves peas as much as I do! I’ve been trying to spice up my side dishes. I feel like I constantly make the same side dishes with every meal night after night. That’s when I decided to use a jar of pesto sauce, pasta, frozen green peas, heavy cream, and grated parmesan cheese. 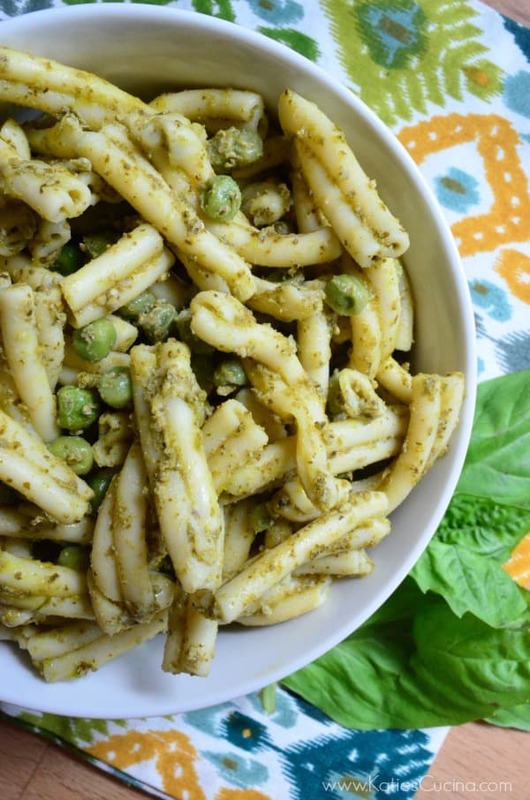 Yes, just five ingredients to make this Pesto Pasta with Peas. Five ingredients ,that I just about always have on hand made for a tasty new side dish. Yes, I’ll be the first to admit that I don’t have any homemade pesto on hand–my poor basil plant bit the dust earlier this summer before I was able to harvest enough basil for pesto. So when I don’t have homemade pesto on hand I buy the jarred variety. Either way it doesn’t matter. 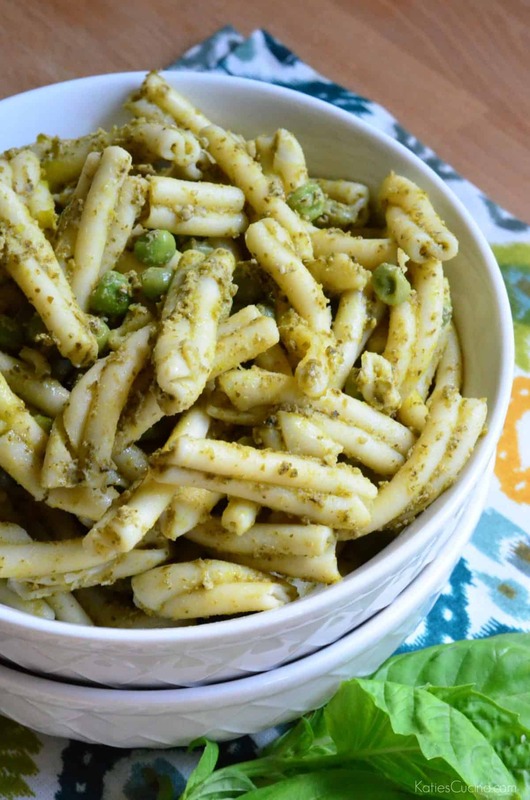 If you’re looking for an easy summer side dish–whether entertaining or just want to jazz up the weekly dinner routine this recipe for Pesto Pasta with Peas is sure to be a winner! In a large pot, cook pasta according to directions. Reserve 1/2 cup of starchy pasta water to the side, then drain. Place half of the pesto in the pot, add cooked pasta, thawed green peas, and the remainder of the pesto. Begin to mix then add in the starchy water. Place heat on low, add in heavy cream and stir until well incorporated and hot. Sprinkle with grated parmesan cheese and serve immediately! This pasta side dish can be served hot or cold! 5 Ingredients to yummsville? I am SO in. 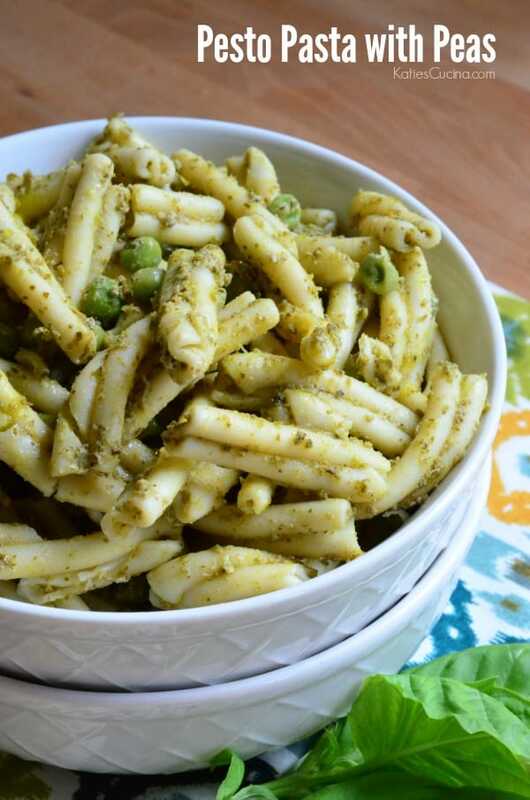 We love pesto (and I keep store bought stuff on hand all the time, so no judging 😉 ) so this sounds perfecto! Pinned! I love peas! haha I also love peas with pasta! I always put them in my Mac and cheese!! Love this recipe, Katie! !